It remains the central reference point in any serious discussion of human capacity for cruelty and systematic killing. It remains a focal point for debate and intense disagreement, for rationalisation and even for denial and dismissal three- quarters of a century later. It also provides the inspiration for some of the finest literature on what it means to be human in a world of profound injustice and threat. The Holocaust (often referred to as the ‘Shoah’ or ‘catastrophe’) is marked tomorrow by International Holocaust Remembrance Day. A day that highlights the calculated killing of approximately six million Jews simply because they were Jews. Additionally, the Holocaust witnessed the murder of, at least the same number of Soviet citizens, Soviet prisoners of war, ethnic Poles, Serbians, Roma and gay men, as well as political opponents in Germany and elsewhere. The significance of the Holocaust is hinted at in the fact that the Jews killed represented approximately one third of the world population of Jews and some two-thirds of European Jews. The nature of the event itself was such that Champetier de Ribes, the French Prosecutor at the subsequent Nuremberg Trials argued “this was a crime so monstrous, so undreamt of in history… that the term ‘genocide’ has had to be coined to define it”. As a result, this January 27, we not only mark the 70th anniversary of the Convention on the Prevention and Punishment of the Crime of Genocide but also the underlying Universal Declaration of Human Rights adopted in 1948. So, some three-quarters of a century later the question arises as to why we should still stop to reflect on such inhumanity and brutality and why we should continue to remember those who were its victims. For too many, the Holocaust was then and this is now; times have changed, so why drag up old history? Initially, an obvious reason suggests itself. Genocide has continued to occur, for example in Rwanda in 1994 and, as I write in Myanmar (to the ethnic minority Rohingya people). Sadly, what happened during the Holocaust was not unique and thus demands not just awareness but more importantly vigilance at multiple levels. We like to take comfort in the belief that a truly barbaric crime such as genocide is ‘external’ to us. It is carried out by despots, fanatics, robotic soldiers and their leaders, by the uneducated and the easily led. Above all, it happens ‘over there’, in places wholly different to ours or in times well removed from the sophisticated ‘modern’. Recognising the ‘European-ness’ of the Holocaust, the direct and indirect involvement of very many ‘ordinary’ Europeans and their institutions and governments is a deeply unsettling idea. It also lies at the very heart of today’s debate on the future of the European project begun in the wake of that genocide. There are many other lessons to be learned and at least four of them have immediate relevance today. One. About how it starts. Some of the questions most often posed include ‘how was this genocide allowed to happen?’ Why did so many Germans and other Europeans allow it to happen? Surely the ‘international community’ could have done more to prevent the build-up of a genocidal context? History suggests that genocide does not just happen, the circumstances and contexts which make it possible evolve over time and across a society. Many of them initially appear to be a part of ‘normal’ political behaviour and practice. Millions of tiny, small events contributing to a context where bigger, more momentous events become possible, are even deemed ‘desirable’. For example, labelling people in order to separate them out from the general population and then requiring certain groups to adhere to special legal or administrative provisions different from those of a general population. Insisting that such groups have ‘devious plans and strategies’ or chanting that ‘they’ are different from us, do not adhere to our ‘values and traditions’ and that they undermine our society. A key stage (analyst Gregory Stanton suggests there are seven stages) in the buildup to genocide is the emergence of assertion that ‘they’ are in some way less than human or at least ‘less human’ than we are. Two. About our role. The active pursuit of an agenda of ‘wall-building’. Such walls were/are routinely metaphorical but, as we see today, they are also cruelly physical. Separating ‘them’ from ‘us’ in order to reinforce and emphasise difference and actively ignoring commonality as human beings generates immense risk and insecurity. And, not just to ‘them’ but also to ‘us’, most especially when we refuse to recognise it. Our ‘bright lights’ of certainty routinely blind us. For genocide to begin to be possible, it is important that whole segments of a society ‘buy into’ the agenda of difference, distrust and fear. Three. About building walls. The creation of a world of ‘diluted responsibility’ locally, nationally and internationally contributes enormously to creating potential genocidal contexts. Insisting that I have responsibility only for myself and my immediate circle allows us to ‘look away’. It also fosters the view that ‘someone else’ must do something. It permits us to believe that there is ‘nothing’ that I can do. Building a ‘get out clause’, a culture of denial so that we can argue ‘we didn’t know’ becomes routine. Stanton’s last stage is that of denial – ‘not me’. We like to imagine that events such as genocide are defined by a litany of unimaginably barbaric acts and direct and intimate violence. But history suggests that it is simultaneously a story of practised omissions, one of distanced and indirect ‘allowing’ of violence. The inhumanity of genocide is revealed not just in the use of gas chambers, bullets, machetes, policy positions and administrative regulations but crucially in the carefully calculated silences, inactions and denials. Four. About hatred and discriminations. Exploring the history of genocide or of crimes against humanity offers insight into the roots of social and cultural behaviour which lead up to mass murder. Prejudice, bigotry, stereotyping, religious or ethnic hatreds, discriminations (large and small) and of course racism become lethal especially when tolerated across a society. History also teaches that as individuals and collectivities, we can participate sometimes as perpetrators, sometimes as victims but most often as bystanders. Other lessons are suggested. The importance of a strong free press and the dangers of a controlled and manipulated one or the dangers of power becoming concentrated in the hands of a small, self-perpetuating group. The isolation of opposition groups or failures in educational policy and delivery etc. Today, as we actively create an increasingly inward-looking and grossly unequal world (as characterised by the debates on Bolsonaro’s Brazil, Trump’s America, Brexit, on migration ‘crises’ in Europe and Australia etc. ), myopia and fear dominate. They deny those very international obligations and practices put in place following the Holocaust or Rwanda. Obligations and practices meant to protect us, often from our own excesses. International agreements on many issues such as climate change, refugees and the world’s hungry have been enthusiastically set aside with celebration. Many opportunist politicians, business interests and far too much uncritical popular and media sentiment challenge this internationalism with mob howls of ‘my country first’. The famous statement of Spanish philosopher and poet George Santayana that those who do not learn from history are doomed to repeat it remains relevant but it is by no means sufficient. 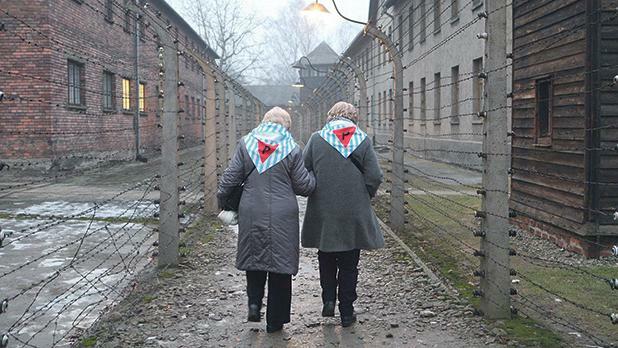 It is not enough to simply learn from history or to genuflect to the memory of the Holocaust. Today, it is imperative we discuss, debate, expose and challenge so that we genuinely learn the importance of living together more humanely.